Yet another request from Ani. If you want to see her other requests, check them out here and here! 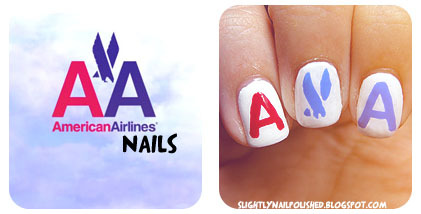 :) This time she asked me to do a manicure based on the American Airlines logo! 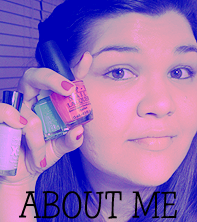 On all my nails I started with a base of French White Creme by Wet N' Wild Wild Shine. Then on my thumb and pinky I sponged a gradient with Bahamian Escape by China Glaze and Secret Peri-Wink-le by China Glaze. Then I added the clouds with white. For the logo, I did the home-made stickers again. 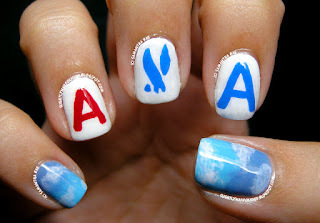 For the red I used Cherry Red by Sally Hansen Xtreme Wear and the blue is Pacific Blue by Sally Hansen Xtreme Wear. I struggled with these a little because I made them a little to far in advanced. They were really stiff and wouldn't wrap around the curve of my nails. So I had to redo the stickers. But oh well! You've gotta learn from your mistakes, I guess. Again, all my thanks goes out to Ani. I hope she, and everyone else, loves this mani as much as I do. :) Enjoy!